Nowadays each individual is making short films without considering the experience to take it. Apart from that most of the people who take short films will be stuck with many concerns that no one knows. But everyone makes the critics and comments after arriving into streaming media. Below are the comments and the annoying problem we collected from upcoming ShortFilm Creators and Filmmakers. 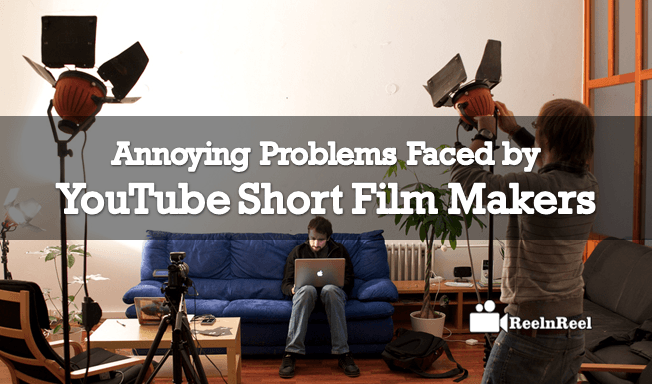 These are real problems from real short filmmakers. The production team will give the unexpected problems while shooting. They get a headache with the female artists because they demand the more money by making excuses on behalf of parents and some other people like not to act in movies. If they completed the full shooting but they didn’t get copyrights for music will give the too much pain that one never expected. As a maker of a short film, they always look for the Camera which is very cheap but more efficient and this will eat the time to decide. They face a risk at the mismatch of budgets for artists and music. As the entire movie will be reflected by the composition of music they should choose good recording studio. After completion the movie they are in confusion of whether to upload in own YouTube Channel or need to approach a YouTube MCN. Each person will be hooked with the no idea of promotion and the announcement of the movie will be delayed due to lack of promotional strategy. The female artists will give much trouble for them. They suddenly bring the notice that they want to quit in the middle of the shooting which will be very annoying. When the movie is almost finished sometimes they might get the blurred Video Footage while reviewing and this is due to the problem of the Camera Lens and Lighting. Lack of lightening i.e. when they plan for day time with no lightening equipment and the weather didn’t support them then this makes a problem. They find a difficulty in selecting costumes for the artists. Though the characters fully opt then they make a mistake at choosing the story and making the screenplay. This gives the complete disappointment for them. The common problem they create by their selves is that they pick the new candidates at a lower cost without considering the experience. They mess up with the production problems which are caused by music, dubbing and editing. They feel hard at transportation i.e. the hero/artists of the movie may demand the needed a car or motorbike which they can’t offer. Choose the proper platform of social media such as Facebook, Twitter and YouTube for launching the movie and mislead of this will give the unpopularity of the movie. Incorrect decision of announcement of the release date and time of the movie will pull down the fame of the movie. Releasing the movie when there is something happening big in the platform.So timing is very important for releasing the short film. Before taking the short film everyone should keep all these points in the mind to get the brief idea of the issues occurs. Perhaps, it happens we can have the measures to solve it on time.